Every once in awhile, I will share a recently read book in a monthly favourites, but it's definitely something I don't get too much into on this here blog. 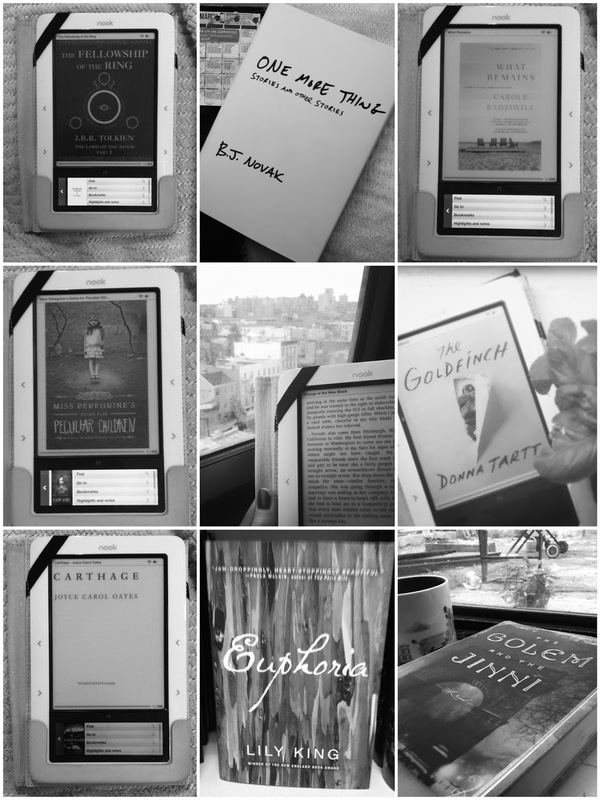 After making a New Year's Resolution to read at least one book a month, I thought I would let you know my progress with a check-in at the half-way mark. Where did 2014 go?? Now, I am terrible at book summaries, either delving in too little or revealing too much. So, I will (try to) keep this brief & simple. Most of these are well-known or new releases, so you have probably already heard of them or spotted them at your local Barnes & Noble. I've loved all the shows and movies BJ Novak has been a part of, so when I heard he was releasing a book of short stories, I was intrigued. Though it's short stories, and they are really short, I really couldn't put it down. They are so funny yet cerebral. Meta. Highly recommend if you are looking for something really simple, funny, and easy to get into. It's a good book to pass along to friends or just share a particularly funny story. It's no secret I'm a huge fan of Bravo's Real Housewives. And after watching episode after episode of RHONY revolve around the ghost writer fiasco, I decided to read Carole Radziwell's memoir (so I guess those episodes did exactly what they were intended to...) It was a truly touching account of some life changing events in her life-love, friendship, career, and tragedy. If you are into memoirs, this is a good one. It will also give you more reasons to hate Aviva for claiming Carole didn't write this. I have to admit, I am not much of a YA reader. The plot lines just don't really do it for me and the worlds tend to be overly simplistic. The creepy cover and pictures of this one had me curious and with a male protagonist, I was hoping to avoid the 'love triangle' device of so many in the genre. It was suspenseful and an interesting world. I am not in any hurry to read the recently released sequel, but I enjoyed reading this one and trying to figure out the mysteries. Being in the criminal justice field, I shy away from media regarding it as it can be a pet peeve of mine when things are told incorrectly. I know super annoying, but I'm sure you know what I mean. But I was on a memoir kick after reading What Remains, and I love the Netflix show. I really liked it, and it had me pumped for Season 2 (though now that's all overrrr). It's fun to see how the show works in her experiences and deviates from them. Though, it already is quite a dramatic story. When I'm looking for something new to read, it's easy to look at the new popular releases, and I was hearing a lot of buzz about this one. I really had no idea what it was about when I started, especially seeing that is was over 700 pages. If you are a fan of coming-of-age novels, I would highly recommend this one. It's long, but in a good way. I honestly wished it was even longer as the ending doesn't quite get into as much detail as you would have expected compared to the other sections, but that could be the point since, well, that's life. On my to-read list are her other books. I think A Secret History will be next up. So I am really into anthropology period pieces. Is that even a genre? Well, I am into them. New worlds, science, human emotions-what's not to love? I know I complained about love triangles earlier, but I reserve that reservation for young adult fiction...or just bad fiction. When it's anthropologists in a new strange world it's all good. This one is nice, quick summer read. Not as dense or thought-provoking as The People in the Trees, but good. It gives me faith there will be more books in this weirdly specific niche. Currently reading this one. It was a recommendation from Preston's mom, and I am into it. I am about halfway done, so I can't give an ultimate opinion. It's set in old New York, very true to the period, but with a twist of a couple of supposed fables come to life. Despite the namesakes being supernatural they speak a lot to the human condition. I just can't wait to see what happens next to the Golem and the Jinni. If you want to add any of these to your summer reading list, I have made a Luvocracy collection. Is it weird to have a Book Collection on there? I have no idea, but I did it...I'll try to keep it updated the rest of the year. Thank you for the book recommendations, currently searching for a new read!